South Korea has developed into one of Asia’s most affluent countries since partition from the north in 1948. The Republic of Korea was proclaimed in August 1948 and received UN-backed support from the US after it was invaded by the North two years later. The Korean War ended in 1953 without a peace agreement, leaving South Korea technically at war for more than fifty years. However, on 27th April 2018, the 3rd Inter-Korean Summit took place between Moon Jae In, president of South Korea and Kim Jong Un, supreme leader of North Korea. The summit was held in the Peace House near the demarcation line in Panmujeon, South Korea and marked the first time since 1953 that a North Korean leader had visited the South. President Moon Jae In was also invited by the supreme leader to take a step onto North Korea side. The summit was mainly focused on North Korean nuclear weapons and the denuclearisation of the Korean peninsula. During the press conference; the two leaders announced an end to hostile activities with a commitment to denuclearisation. They also agreed to turn the Korean armistice agreement into a peace treaty. On May 5th and as a first step for reconciliation, North Korea has shifted its time zone 30 minutes earlier to align with South Korea. In traditional Korea, the typical family was large with three or four generations usually living together. Because infant mortality was high and a big family was thought of as a blessing, having many children was desired. However, the rapid industrialization and urbanization of the country in the 1960s and 1970s were accompanied by an effective birth control drive, and the average number of children in a family dramatically decreased to two or less in the 1980s. Industrialisation of the country has made life more hectic and complicated. Young married couples have begun to separate from their extended families and start their own homes. Now almost all families are couple-centered nuclear families. Koreans think marriage is the most important passage in one’s life and a divorce is regarded as a disgrace not only for the couple but also for their families ― even though the divorce rate is growing rapidly these days. Today’s typical wedding ceremony is somewhat different from what it was in old times: first a Western-style ceremony is usually held at a wedding hall or a church with the bride wearing a white dress and the groom wearing a tuxedo, then later in the day the bride and groom have a traditional ceremony at a different room in the venue, in colourful traditional costumes. According to a traditional Korean belief, when people die, their spirits do not immediately depart; they stay with descendants for four generations. During this period the deceased are still regarded as family members and Koreans reaffirm the relationship between ancestors and descendants through jerye on the special days like Sollal (Lunar New Year’s Day) and Chuseok (Korean Thanksgiving Day), as well as on the anniversary the ancestors passed away. Koreans also believe that people can live well and happily thanks to benefits their ancestors bestow upon them. When you beckon to a person, do so with your palm down, and then flutter your hand up and down with your fingers touching together. It is not polite to beckon with your palm up ― especially using only one finger, because Koreans do that only for dogs! The hanbok has been the Korean people’s unique traditional costume for thousands of years. The beauty and grace of Korean culture can be seen in photographs of women dressed in the hanbok. Before the arrival of Western-style clothing one hundred years ago, the hanbok was everyday attire. Men wore jeogori (Korean jackets) with baji (trousers) while women wore jeogori with chima (skirt). Today, the hanbok is worn on days of celebration such as wedding, Seollal (Lunar New Year’s Day) or Chuseok (Korean Thanksgiving Day). A traditional Korean house is called ‘Hanok’. Hanok sought to create a living space based on the coexistence of nature and humans. Accordingly, the natural aspects of a traditional Korean houses range from the structure’s inner layout to the building materials which were used. Another unique feature of traditional houses is their special design for cooling the interior in the summer and heating the interior in the winter. Since Korea has such hot summers and cold winters, the ‘ondol gudeul,’ a floor-based heating system and ‘daecheong,’ a cool wooden-floor style hall were devised long ago to help Koreans survive the frigid winters and to make the sweltering and humid summers bearable. These primitive types of heating and air-conditioning were so effective that they are still in use in many homes today. • The population of South Korea is just over 50 Million. Almost 10 million people (40% of the population) live in Seoul, 3.5 million live in Busan and 2.5 million live in Daegu. The vast majority of Koreans live in heavily urbanized cities from 100,000-10 million in population. • North Korea borders China. Japan is a short ferry trip from the south coast of South Korea. • It takes about 6 hours to drive from the top to the bottom of South Korea – a lot less on the KTX (high speed train). • Korea has a continental climate with dry cold winters and hot humid summers. There is a swift transition from winter to summer conditions between April to early May with an equal reversal in late October. The wettest months are between June and September. The average temperature ranges in Seoul are from -9 to 0 degrees Celsius in January to 22 to 31 degrees Celsius in August. • The principal national religions are Confucianism, Shamanism, Christianity, Buddhism and Chondokyo. • Korean is spoken by the entire population. English is the principal secondary language and is taught in all secondary schools. • Mountains cover 70% of Korea’s land mass, making it one of the most mountainous regions in the world. • The majority of Koreans have one of the following surnames: Kim, Lee, Park, Choi, Jeong, Jang, Han, and Lim. • A Korean name consists of a family name, in almost every case one syllable, plus a given name usually of two syllables. The surname comes first. • A Korean woman does not take her husband’s family name, but their children take their father’s family name. • The Korean flag is called “Taegeukgi” in Korean. The white background of the flag means peace. The red and blue circle in the center is called ‘Taeguk’, the origin of all things in the universe. The blue part of ‘Taeguk’ is called ‘Eum’ and represents all negative aspects of the balance that is typical for the symbol. The red part is called ‘Yang’ and describes all positive aspects. The trigrams are heaven (upper-left) and at the other corner earth, water (upper-right) and at the other corner fire. Food in Korea ranges from being quite bland (fried rice covered over with a thin omelette often topped off with a squirt of tomato ketchup) to eye wateringly spicy. Koreans like to use chillies in their cooking and lots of garlic. Meals are usually served with an array of side dishes. The most popular is kimchi. Adored by all Koreans, it is spicy, fermented, pickled cabbage. Kimchi is not appreciated by the majority of new foreigners in Korea – especially on the breath of students. However, like many good things in life kimchi is an acquired taste. You will learn to appreciate it and may even come to love it. Korean food really is very tasty. Eating out in Korea is so cheap that most teachers eat out every evening. Alternatively, restaurants can deliver food directly to your door. A delivery man on a scooter drops off the food and comes later for the dirty dishes. Who can argue with that? Yes, Koreans do eat dog meat. Dog is considered to be very healthy and is widely acclaimed as being ‘good for men’s stamina’ although its effect on women is not mentioned. It is very unlikely that you would be served dog meat unwittingly, as it is quite an expensive meat. The cartoon dog painted on the sign above the restaurant may also be a good indicator. In all probability you will see things on Korean tables that will make you squirm. All manners of sea creatures that you didn’t know existed are eaten, sometimes alive. You may also be offered chicken feet or gizzards or even barbecued pig colon. Whether or not you choose to try these delicacies is entirely up to you but my advice is to keep a tissue handy in case you have to spit anything out – discretely of course. If the above paragraph has left you in doubt as to whether you could cope with life in Korea do not despair. Among the weird and wonderful array of dishes available there are countless tasty delights to be had. Korean cuisine is widely under rated. I would defy anyone to go to Korea and not find a dish that they truly love. In any case, every form of fast food from Pizza hut, Burger King, KFC and Subway Sandwiches is likely to be available in your town or city in case of emergencies. Vegetarians often find it difficult to remain true to their ideals in Korea unless they are keen on cooking for themselves or live in one of the bigger cities in Korea. Having said that, a vast array of vegetables is available from Korean markets and rice, noodles and tofu are staples in the Korean diet. Going out to eat can be problematic for vegetarians as most dishes contain some form of meat and even if you ask for something without the meat they often will bring it to you with the meat anyway, saying, ‘It’s okay, there’s no extra charge’. The whole vegetarian concept is largely lost on Koreans unless as mentioned you are in a large city. Many western vegetarians find that they can survive quite well by adding fish to their diet. This is often a good compromise. There’s lots to keep you occupied in Korea. For the more active there’s hiking on beautiful mountains or playing sports. After being hosts to the World Cup in 2002, football/soccer is very popular in Korea. Basketball and baseball are also popular. Use Facebook to research ‘foreigner’ teams and leagues in your town or city. The Korean Foreigner Football League includes teams from Daegu, Busan, Daejeon and Pohang. Many foreigners take up a martial art. Tae-Kwon-Do is Korea’s national sport and if you work hard enough you can have a black belt within a year. There are sports centres, pool halls and swimming pools all over Korea. Sightseeing trips to some of the majestic Buddhist temples, national parks and coastlines are a must. You may even fancy a trip to one of Korea’s islands or to the demilitarised zone between North and South Korea. For the less energetic there are many cinemas with movies in English (with Korean subtitles). Video and DVD rental stores are on almost every street corner. Video and DVD rooms are also commonplace. These are private rooms you can go to with friends to watch a movie. For the more social there are numerous bars, soju tents and some good dance clubs. Korean karaoke rooms (norebang) are usually feared by the ‘newbie teacher’ however, inevitably after some time (and probably some soju) norebang will become your favourite pastime. For the most up-to-date information on the best places to hang out ask other foreigners who have been in your town or city for some time. Adventure Korea is a travel club which organises trips and events throughout the year. Trips include snow and mud festivals, skiing, snowboarding and ice fishing, trips to the DMZ, beach and island trips and much more. Joining adventure Korea is a great way to make new friends, explore Korea and have a lot of fun. The Korean alphabet, Hangeul is a phonetic alphabet with 14 consonants and 10 vowels. It is the world’s most scientific writing system and is surprisingly easy to learn. A little bit of Korean goes a long way. Within your first couple of weeks in Korea you will no doubt develop a list of key phrases which gets you through your daily life in Korea – how to order food and drinks, how to direct a taxi driver to where you want to go, how to tell your students to sit down (actually most schools prefer teachers not to use Korean in their classroom!). On a day to day basis you are likely to use mostly English. Learning Korean is not essential for daily life in Korea. It is possible to live very well in Korea without knowing much Korean at all. However, learning Korean deepens your understanding of Koreans and their culture. It affords you the freedom to go where you like, do anything you want and it allows you to make the most of your time in Korea. Learn to read the Korean alphabet in 30 minutes with Charm Lee. There are several online programmes for learning Korean. Sogang University’s Korean Program is particularly good because you can listen to each lesson and check your pronunciation. 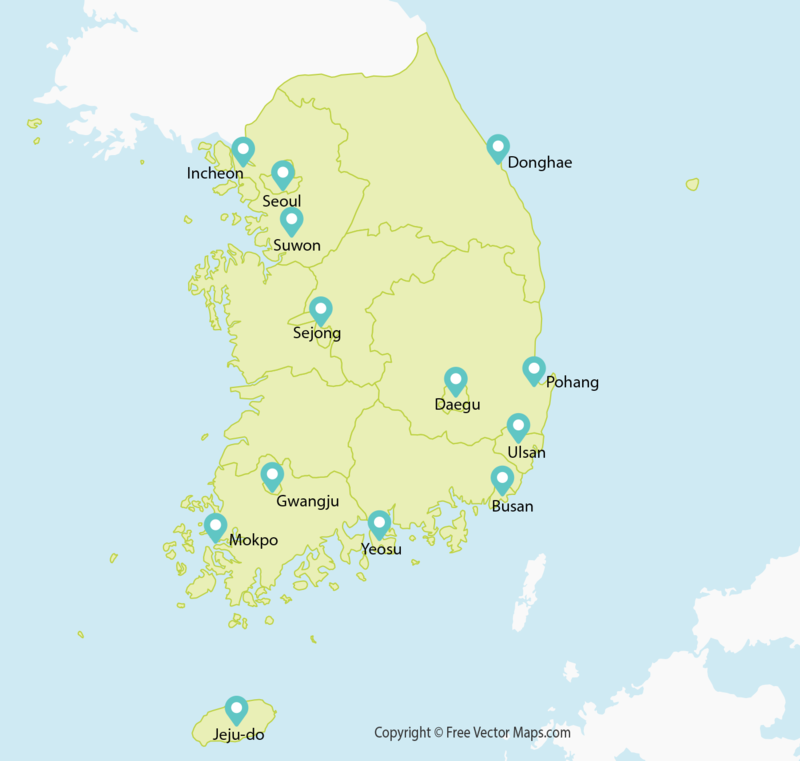 Korea is a relatively small country and public transport is excellent so teachers often visit other towns and cities at the weekends and during holidays. Buses and trains run throughout the country. A local bus ride costs between 500 and 800 won. In larger cities subways run from 5:30am until midnight. Taxis are everywhere. They are cheap and very convenient. There are regular domestic and international flights and it is easy to get ferries to Korea’s many islands or to Japan. since 2044 Korea has had a high-speed train (KTX) which operate at speeds of 300km per hour. In the past travelling from Seoul to Pusan took approximately four hours. It now takes two and a half hours. The KTX means getting from one end of the country to the other is fast, safe, convenient and environmentally friendly.